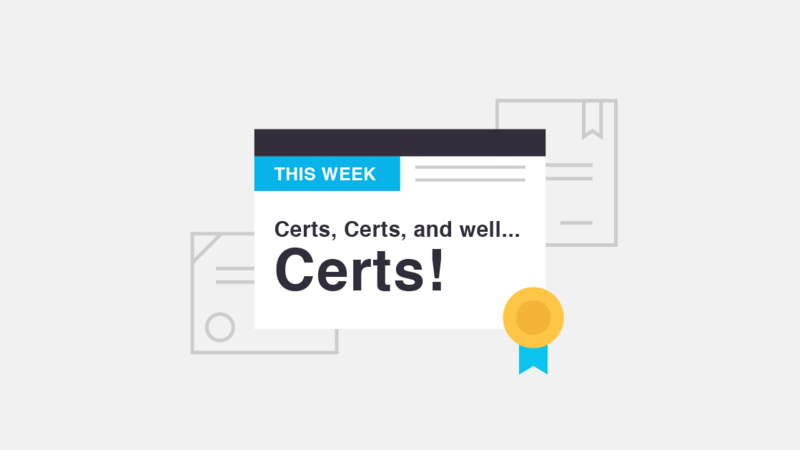 This Week: Certs, Certs, and well, Certs! Blog home / Everything CBTN / This Week: Certs, Certs, and well, Certs! New Year’s resolutions can be tough to keep. Why not earn a new IT certification this year, instead? It’s the kind of goal that can really better your life. This week on the CBT Nuggets blog, we took a look at the best certs to earn this year without sacrificing your bank account or your social life. Are you the budget-conscious type? The IT certification journey can be expensive, but it doesn’t have to be. You just have to know where to look. Here are six certs that won’t break the bank and will actually allow you to make more money! It’s timeless advice: If you want to succeed in IT, you’ve always got to be learning and keeping your skills sharp. To help inspire you, we identified the IT certifications you should add to your resume this year. Money isn’t everything, but it can go a long way toward feeling appreciated. That being said, asking for a raise isn’t always an easy task. There are a lot of considerations to be made before popping the question. Be prepared with strong arguments as to why you deserve that raise. A lot of hours and collateral go into the IT certification journey. There’s also the challenge of mastering a new technology. We decided to find middle ground with a list of certs that won’t cost a fortune, consume your life, and still make you in demand to employers. Just because an IT certification isn’t well-known or sought after doesn’t mean it’s not a worthwhile pursuit. In fact, here are some certifications we think will gain more attention this year. Looking to get ahead of the curve? You’ve come to the right place.